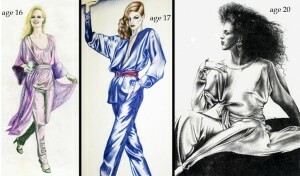 When I was a teenager, I loved drawing fashion from magazines, but was still honing my skill. My high school art teacher introduced me to the incredible fashion illustration of George Stavrinos, whose work for Bergdorf Goodman was found within the pages of Vogue magazine. What an epiphany! His stunning fashion works of art, as they all are, truly left me speechless. His architectural, yet fluid rendering and attention to detail was a visual feast. I was determined to emulate him, as, I reasoned, his style was what I wanted to accomplish. In a few months my work had undergone a drastic improvement. I obtained college degrees in illustration and became a commercial illustrator for advertising and publishing companies over the years, drawing everything you can imagine, from fashion to medical diagrams. I found fellow Stavrinos fans on the internet and created the Fans of George Stavrinos, Artist & Illustrator page on Facebook. Many members of the group knew George personally and share their images and stories. I’m jealous! Over the years my journey as an illustrator has taken many different turns, but, I still come back to the wonderful world of George Stavrinos, gone from us far too soon. He continues to inspire us to perfect our draftsmanship and let our imaginations take flight. Isn’t it amazing to have such a timeline of your progress? You can see just how comfortable and assured you’d become at twenty. BTW, Alva Chinn, the model you illustrated at twenty, is on Facebook. I’ll bet she would love it.